Pump stations come in many shapes and sizes. With so many options for customization depending on the needs of the customer, you could almost say that no two pump stations are exactly alike. That might be a bit of a stretch, but it’s definitely not a stretch to say that all pump stations aren’t created equal. Those exposed to the elements come with an obvious set of challenges and normally age more quickly due to exposure, while pump stations set below ground level increase safety risks and costs (if a permit is required) by creating a confined space. 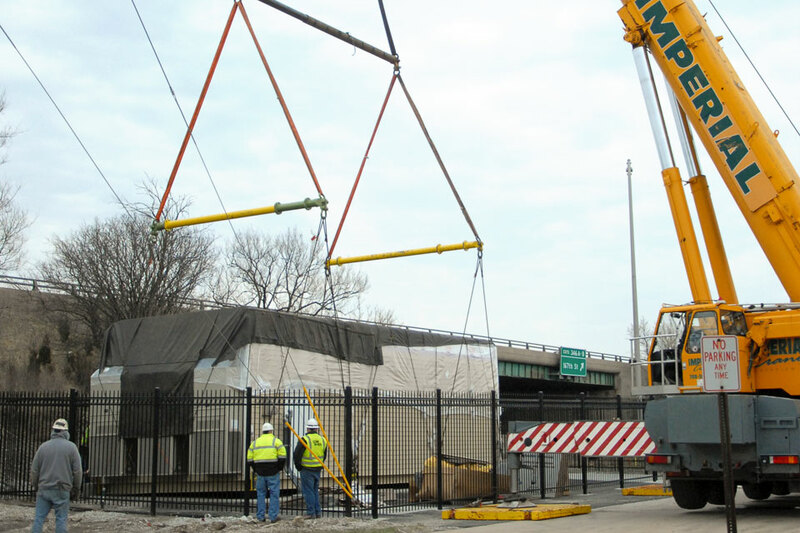 When the City of Oak Lawn set out to upgrade its own aging infrastructure and confined space pump station, it was determined that an above ground station was the answer. When the lead contractor set out to plan the job, Metropolitan met all the specifications, had a reputation for quality in the industry, and offered round the clock support. However, meeting specs is only the tip of the iceberg and 24/7 support typically only comes in handy after things are connected. In other words, it’s easy to make those claims. The real difference comes to light in the space between meeting specs and offering service. The real difference is in delivering from start to finish. At Metropolitan, we understand the importance of building a reliable pump station and, to accomplish that, we’ve got you covered from the first pipe to the final shingle. 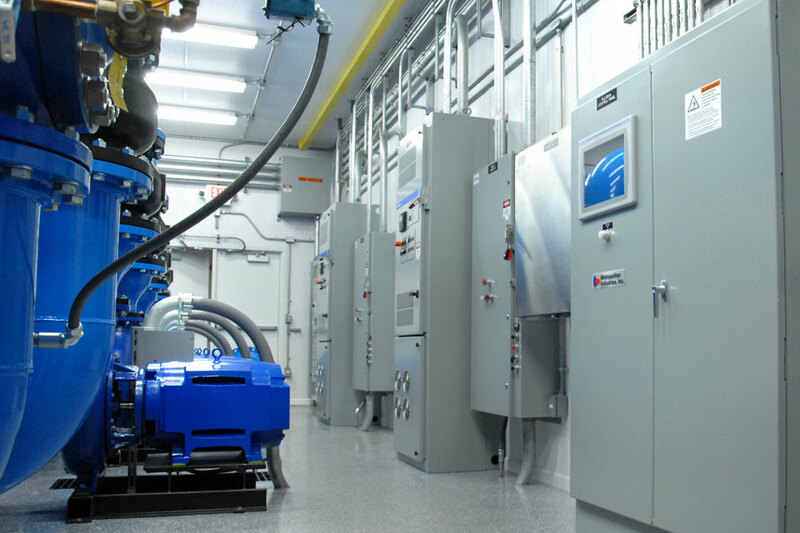 To help guarantee quality and ensure that every component of a Metropolitan pump station arrives in perfect condition, we build ours in our Romeoville, Illinois facility. That means we’re actually building your roof under ours. This approach allows us to remain on schedule by working regardless of the weather and it enables us to test everything before delivering. Pump stations must normally be tested in the field, but this can cause delays and increased costs. With our on-site testing capabilities, we can work to guarantee that every valve, pump, and handle function properly. With systems shipping all over the country, these tests are especially critical, but testing all components is equally important. PLC- based control system operates the (4) pumps in variable or constant speed modes to maintain constant pressure. Four 125 HP end suction pumps are capable of delivering over 10,000 GPM through 24” piping. The building itself must provide adequate protection from the elements. A Hardie TM board exterior with numerous facade customization options and an FRP interior help create structural integrity with every Metropolitan pump station, while blown-in closed cell insulation provides temperature protection. This approach protects valuable equipment and makes the structure compliant with various building codes. To ensure the system is always up and running, the installation of a diesel or natural gas generator is also possible. In addition to serving its purpose as shelter, every pump station must allow for seamless day-to-day operations. For Oak Lawn, that meant all pumps, controls, and the chemical room — a customization requested by the municipality — needed to be accessible at all times. In part, this is made possible by the climate controlled, enclosed space of the pump station itself. By removing the elements, operators can work without worrying about the weather, and with accessibility options such as cranes, hoists, and overhead doors, service is simplified. To design and build a lasting, reliable structure, we begin with full three-dimensional renderings that help clients understand the space and its possibilities. 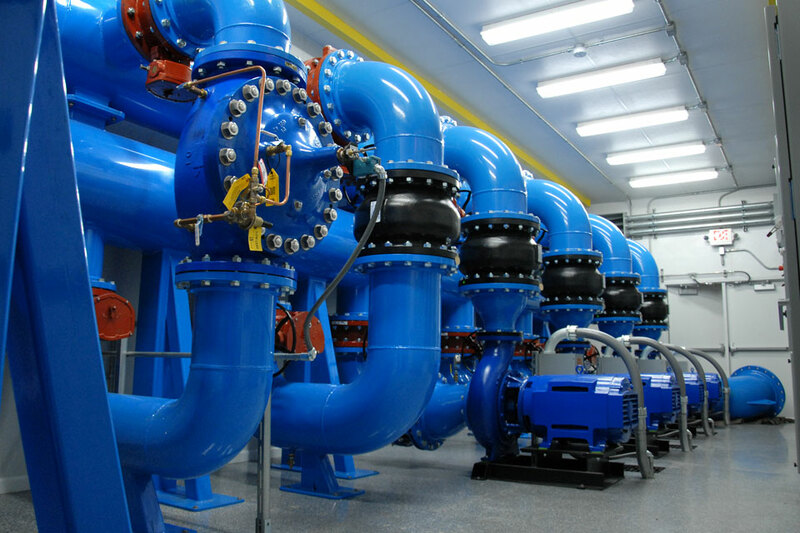 Our design engineers are experts in the world of pumps and pump systems, allowing us to design pump stations that function as planned in Metropolitan’s test lab and in daily use. From a range of available pump options from various manufacturers to the UL listed controls to the software that keeps everything running, we cover it all. Following design approval, the structure is built, tested, and arranged for delivery. In Oak Lawn, our attention to detail and our deep understanding of the needs of municipalities combined to produce a pump station that will serve the community for decades. Not only that, but we plan to be around to provide the city with the support it needs as it grows and continues to change. We always feel a sense of accomplishment when we can check design, construction, and installation off the client to-do list, but we never put a mark beside “24/7 Support and Service” because we’ll never be done offering that. For more information our prefabricated housed systems, visit metropolitanind.com.